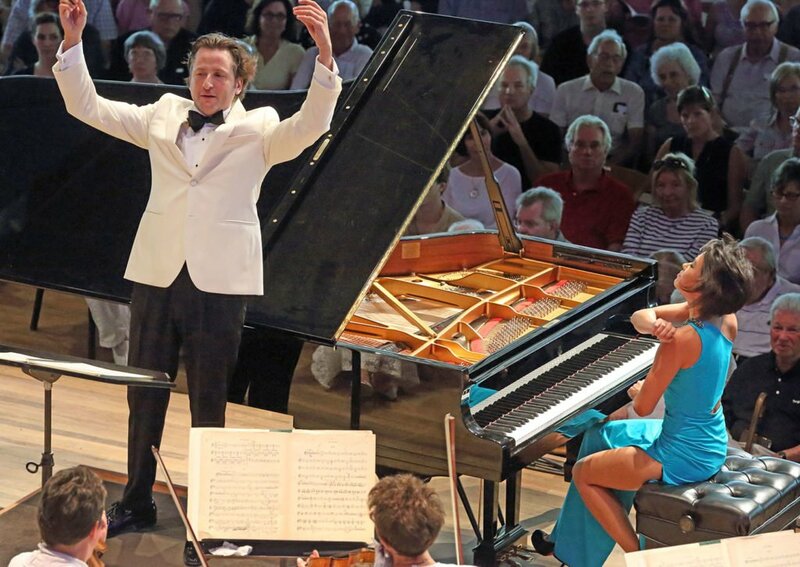 The gifted young Spanish conductor Gustavo Gimeno made his Boston Symphony debut at Tanglewood on Sunday afternoon; the dynamic pianist Yuja Wang joined for two favorite concertos that made a particularly good fit. Utterly perfect weather and a popular program attracted a large and receptive crowd for the performance. Just ending his first year as Principal Conductor of the Orchestre Philharmonique de Luxembourg, Gimenoshowed a precise, clear beat with gestures responsive to the shaping of the musical phrases in mood and color and character, building very satisfying performances of two Russian works from the beginning of the 20th century—Prokofiev’s Classical Symphony to open and the 1919 suite from Stravinsky’s Firebird to close the concert, as well as two piano concertos from the following decade or so; Ravel’s Concerto in G and Gershwin’s Rhapsody in Blue, both tinged with jazzy infusions, fit perfectly on either side of intermission. Prokofiev’s Classical Symphony is a good-humored opener, one that is often played for the joky quality of sudden harmonic jolts, irregular phrasing, and so on, with an orchestra of, essentially, the character of Haydn’s. Yet certain passages, even in fast movements, can express more than the inherent humor, and Gimeno brought these out effectively, while not missing the opportunities for sardonic wit either. One passage that struck me particularly comes during a fairly extended section in the slow movement with all the strings playing pizzicato 16th notes while the bassoon (sometimes both bassoons) doubles the cello/bass line in staccato. The unified precision impressed, especially with the many adjustment of dynamics. Small swells and decrescendos finally approached a major climax for the full orchestra with a carefully worked out approach to the fortissimo. Attention was clearly lavished on the details. The famous, amusing Gavotte generated smiles for the subtle flexibility of accents and phrasing with which Gimeno shaped it. The finale was indeed—as called for—Molto vivace, all of its seemingly Haydnseque gestures presented in a brilliant orchestra just slightly larger than Haydn’s own (he rarely used clarinets, and he called for two timpani at most), yet brilliantly scored in a way calling for playing far more virtuosic than that of the late 18th century. It is quite possible that Ravel’s Concerto in G was intended to be one of the dozen works commissioned by the Boston Symphony for its 50th anniversary in 1931. At any rate the composer’s name was listed at one point among the composers who would be providing new pieces. But Ravel was having increasing difficulty conceiving music at the time, and the slowness of is progress may have caused him to drop out of the commissioning plan. Still, if the piece had been originally intended for Boston, that goes a long way toward explaining its “American” qualities—especially the hints of blues in the first movement. And it makes the pairing of the Concerto in G with Gershwin’s Rhapsody in Blue a particularly happy pairing. After all, Ravel had traveled in this country in the late ‘20s and had met (and expressed admiration for) Gershwin. The commanding Chinese-born pianist Yuja Wang gave an energetically colored account of the Ravel, bringing out the bluesy inflections while shaping the phrasing in effective coordination with Gimeno’s treatment of the orchestra. She met all the challenges of virtuosity with elegance, especially in the tender passages, including the hand-crossing elements to caress the upper notes of pianistic arpeggios with her left hand. She offered an equally exciting treatment of Gershwin’s Rhapsody in Blue after intermission, though the brass-heaviness of Ferde Grofe’s orchestration—with the full Boston Symphony behind her—occasionally overpowered the rapid arpeggio figures. Still, there was much that was largely solo playing, dynamic and jazzy in character, or evocatively romantic in the big E-major tune. Whether it was the humidity affecting the keyboard on the sunny afternoon or relative exhaustion after the Ravel, a very few moments were slightly less firmly in hand, with a few “clams” on the crossed-hand high notes. But spirit, energy, drive, and lyricism were there in abundance. Gimeno closed with the 1919 suite—the most often performed version —of Stravinsky’s earliest major success, The Firebird. There are many details for the conductor to attend to in a score like this—overall balance of the different elements of the large orchestra, adjustments of tempi, especially between the formal dances, and the “gestural” music in which the plot unfolds (though most of these are trimmed from the suite), and the dramatic color of the ballet score. The richly evocative reading allowed the players to show off their very considerable abilities with a brilliant sunny close to a cheerful concert. I’d welcome Gustavo Gimeno back any time. Interesting review of a wonderful concert. Are you certain that the Rhapsody in Blue performance had a few “clams”; or were those simply Ms. Wang’s improvisations? Much of her performance of the rhapsody seemed to be either improvisations or cadenzas of her own creation–which is exactly what Gershwin intended for soloists playing his masterpiece.